Attention! Wiping files on SSD devices is not possible in most cases. Read the File Erasure on SSD and HDD devices page for details. Once wiped, a file cannot be restored! No Windows or third-party data recovery utility can do this! 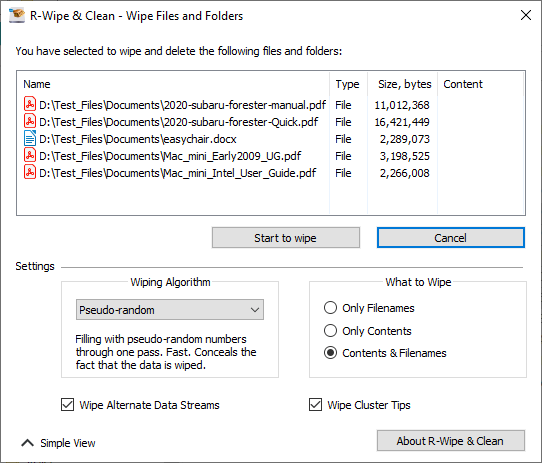 R-Wipe & Clean deletes rather than wipes files if the Wipe files before deleting option on the Settings panel is disabled. Wiping files is disabled on SSD devices by default. You may enable it, but you should understand what you are doing. You do not have to start R-Wipe & Clean to wipe and delete a single file or several files. You may do this from File Explorer . Make sure that you have the Wipe files and folders directly from the shortcut menu option selected on the Integration tab of the Settings panel. • Select and right-click the file(s) in File Explorer and select Wipe and Delete with R-Wipe & Clean on the shortcut menu. The Wipe File Explorer dialog box will appear. • Click the Start to wipe button, and R-Wipe & Clean will wipe the file(s) with default wiping settings. If you want to delete and wipe several files at once, go to the Wipe Lists section for details. You do not have to start R-Wipe & Clean to wipe the contents of the Recycle Bin . You may do this from its shortcut menu. Make sure that the Wipe the Recycle Bin from the shortcut menu option on the Integration tab of the Settings panel is selected. 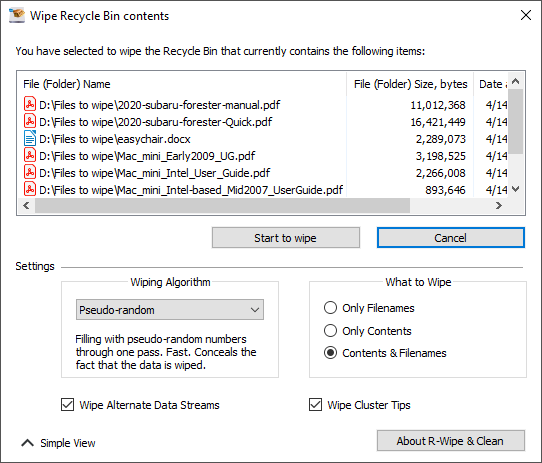 • Right-click the Recycle Bin and select Wipe with R-Wipe & Clean on the shortcut menu. The Wipe Recycle Bin contents dialog box will appear. • Click the Start to wipe button, and R-Wipe & Clean will wipe the Recycle Bin with default wiping settings.